To create this watch, Sinn built on the extremely popular design of the Sinn 757 chronograph and created a black PVD Tegimented case with bracelet. Standard steel used by most watch companies has a hardness of between 200 and 240 HV (Hardness Vickers is a common scale used to measure material hardness). The Tegiment layer on this watch has a hardness of 1,500 Vickers which is seven times harder than standard steel. 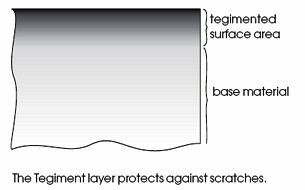 The Tegimenting process also acts as an extra protection for the black PVD coating by providing a harder surface for this material. It is interesting to note that Sinn's black PVD watches are hardened to higher standards than most of their non-black Tegimented watches. What also makes this watch special is its extreme protection from magnetic fields. The case design and inner lining consist of a special iron core making this watch resistant to the effects of magnetism. Dial is matte black with Arabic numerals and offset date display at 4. The design and layout of this watch make it extremely easy to read in virtually all light conditions. Sapphire crystal with luminous hands, hour markers and the 12. Watch is water resistant to 20 ATM. Watch is fitted with a Tegimented PVD steel bracelet with hex screws and solid end links. 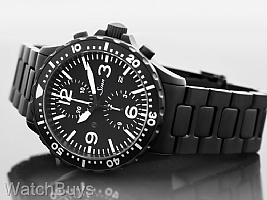 Verified Owner Comments: What a SINN 757 black Tegimented watch! It is such a beauty! It will be on the top of my new watch list!